Guava and cream cheese. Some people reading this will probably think I’m crazy, medicine but it’s really an amazing combination. Every day after school, medicine my grandmother would layer soda crackers with a slice of guava paste and a little cream cheese. Sunday mornings my grandfather would deliver fresh-from-the-oven Cuban pastries filled with guava and cream cheese. And on the 4th of July, ask the guava and cream cheese empanadas were the first to go. They just feel right together. So when my parents and their friends decided to celebrate their 33rd wedding anniversaries with a 70’s Party, I volunteered to make cupcakes for dessert. My special guava and cream cheese cupcakes, to be exact. In keeping with the groovy theme, I tried out a tie-dye look on the frosting, but I’m not sure how successful that turned out. Mostly, they looked confused. Some were yellow, some orange, some a swirly combination of the two. They may have been a little ugly, but they were darn tasty. If guava paste weirds you out (it shouldn’t!) or if you can’t find it, you can substitute any kind of chunky fruit preseves. Just fold some orange marmalade, apricot preserves or strawberry jam into the batter just before you bake the cupcakes. The fruit makes is the perfect compliment to the cream cheese icing. I posted this recipe here about a year ago, but was never really happy with the huge amounts of butter in the frosting and batter. I’ve tweaked the recipe and I think it works much better this way. Heat the oven to 350°. Line muffin pans with paper liners. Cut the Guava paste into small cubes. Sift together the flour, cornstarch, salt, and baking soda in a bowl. With the mixer on low speed, add the flour mixture to the butter mixture until just combined. Gently fold in the Guava pieces. Fill the cupcake liners to the 2/3-level with batter. Bake in the center of the oven for 20 to 30 minutes, until a toothpick comes out clean. Cool to room temperature. For the icing, mix the butter, cream cheese, sugar, and vanilla in the bowl of an electric mixer fitted with the paddle attachment, on low speed, mixing just until smooth. Spread the frosting generously on top of each cupcake. Makes 3 dozen cupcakes or so. 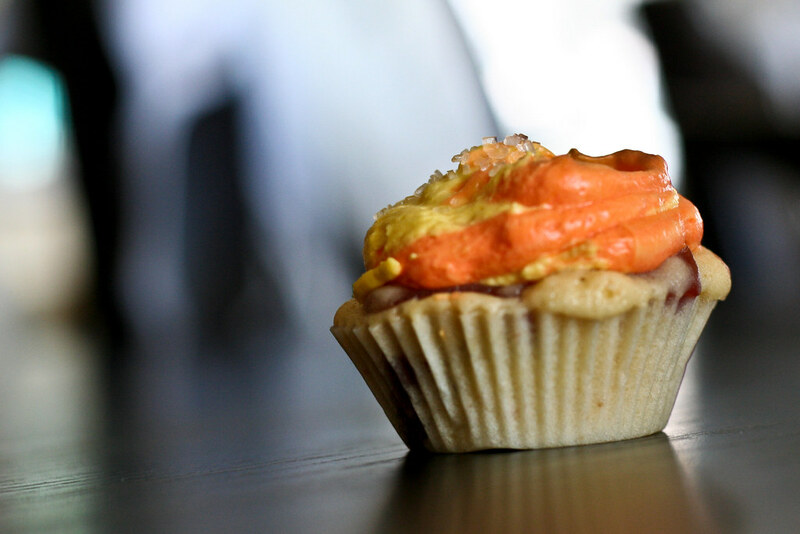 Ahhh.guava and cream cheese cupcake…OUTSTANDING! I hope you didnt get hit too hard by Fay today. It was supposed to come here to Tampa..but yet again..we stay dry! Ooh, I am so intrigued. I’ve recently fallen in love with guava (guava love not yet written up though) and I am looking for more applications of it. This is great! Hi Bitchen! LOL OMG, I am in Miami ALSO! Okay so I am looking for a good recipe. I did one and it was a disaster. I wanted to know if this can be done as a cake instead of cupcakes? I would love to make this for my father in law’s b-day on Saturday. Please e-mail me…….. Your recipe is fantastic! I don’t like sweets but this recipe is truly to die for! I love Guava! My daughter and I could probably eat the whole tree so tasting the Conchita Paste was a pleasure because it is truly the right flavor. Thank you for sharing. I have made many people ask for more by baking this wonderful treat!